The Denver Metro Area Local took donations at the October General Membership Meeting to raise money to help one of our Maintenance members at the GMF Thelma Torres-Ramos. Her home caught fire and she and her two sons are dislpaced from their home and will be for many months, no one was injured in the fire. This is just another example of how your brothers and sisters will come together to help other members when they are truly in need. Thanks to all that donated to the cause! This is the nephew of James Saiz, an APWU member since 1976. 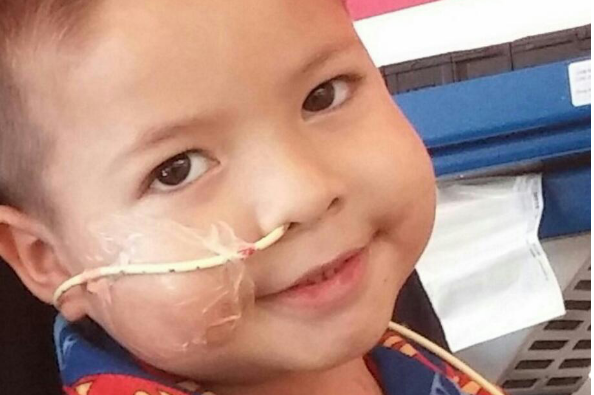 Our strong Hulk, Joshua better known as JR, 4 yrs old, is in need of a heart transplant. Our life was very normal, jr went to pre-k loved playing with his little sister and even played T-Ball in the summer. Jr had gotten a cold on October 15th and we didn't really think anything of it because he never complained. He came home one day after school and was fine than started vomiting. The days after that jr complained that he couldn't walk and always wanting to take breaks and also still vomiting every night. We took him to the ER a couple times and on the third time they did more tests on him, like blood and x-ray tests. First they took an x-Ray of his stomach and didn't see anything but luckily they took the picture to high and got a glimpse of his lungs. They took a second X-Ray of his chest this time and found he had fluid in his right lung and an enlarged heart. The doctors at Cristus St.. Vincent's knew they couldn't care for him so they airlifted him to UNM Hospital in Albuquerque New Mexico to further evaluate him. They did several tests on him and said that he had viral myocarditis. After a week he was looking better and we thought the worst had past. His exterior appearance was improving, including his appetite and energy, but his vitals and heart continued to deteriorate. They conducted an MRI of his chest on Nov 11, and discovered that he had Dilated Cardiomyopathy, which they thought was genetic, and not viral. This meant it was going on for months not jus the three weeks we noticed. They wanted to transfer him to a children's hospital in Aurora Colorado that specializes in pediatric cardiac surgery. When we got here everything went from bad to worse as his heart reached over 200 BPM, he lost consciousness and his heart was unable to work so hard on it's own. He had to be placed on a machine to pump his heart for him called ECMO, as he was no longer able to do it himself. He now must wait for a heart transplant while on an artificial heart called A Berlin Heart, and will be in the hospital for the foreseeable future. We have no choice but to temporarily move from New Mexico to Colorado, away from all our family and friends. We have a car payment and must have cell phones on no matter what so they can call ether of us when his heart gets in and my husband has had to quit his job. We have no money, or stable living arrangements we plan to move back to New Mexico and have to try and get our own place again with trying to take care of all Jr's medical expenses. We dont know what is going to happen after transplant he might be only needing one transplant but then he could go into rejection and dtart this processes all over again we are asking for any help we can get. We appreciate it all, and God bless you.